Tottenham host Everton at Wembley Stadium in the Premier League this Saturday. Will they go level on points with 4th placed Liverpool by securing a victory? 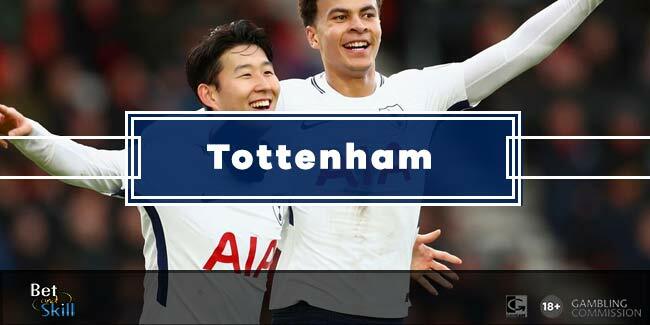 Check out below our Tottenham vs Everton betting preview with predictions, betting tips, probable lineups, team news, enhanced odds, exclusive promotions and no deposit free bets to use on every sport! Tottenham have failed to win only two of their last ten competitive matches as they recorded a disappointing 1-1 home draw against West Ham and a 1-1 draw at Watford. They are fighting to remain in the top four this season and this is a good chance to go level on points with Liverpool, who sit 4th three points above Spurs and host league leaders Man City. The Lilywhites enter this clash on the back of a routine 3-0 win over AFC Wimbledon in FA Cup. Anyway, they have managed just one clean sheet in their last five Premier League matches at Wembley and have taken less home points than any of their top six rivals. In terms of direct matches, Tottenham are unbeaten in their last 10 Premier League games against Everton (W5 D5). Boss Mauricio Pochettino has no fresh injury problems. Toby Alderweireld and Danny Rose are both sidelined, while Harry Winks missed much of the festive period due to an ankle injury and remains a doubt. Victor Wanyama is back to full fitness, though is unlikely to start. As a result, Mousa Dembelè should partner Eric Dier in midfield. Up front, Harry Kane will be supported by Dele Alli, Son Heung Min and Christian Eriksen as usual. Serge Aurier should get the nod over Kieran Trippier at right back, with Ben Davies retaining his starting berth on the other side. Everton sit in ninth place in the standings and has lost three straight matches - 2-1 at Bournemouth and 0-2 at home agasint Manchester UTD in the Premier League, 2-1 against city rivals Liverpool in the FA Cup. Prior to that, the Toffees earned two draws against Chelsea and West Brom, meaning they have no wins in the last five games. Goalscoring remains a big problem as Sam Allardyce's men have only netted 25 goals in 22 league games so far. Plus, they have won only one of their last 19 away matches in Premier League and suffered a 3-0 defeat in the reverse match at Goodison Park last September. Cenk Tosun is in line to make his debut for the Toffees after his big money arrival from Besiktas, with Dominic Calvert-Lewin making room. If Sam Allardyce opts for a 4-1-4-1 formation at Wembley, Gylfi Sigurdsson and Yannick Bolasie may be used out wide, with Morgan Schneiderlin and Wayne Rooney at the centre. Aaron Lennon provides a further option. Idrissa Gueye will anchor the midfield while Mason Holgate should partner Ashely Williams as centre-back, since Michael Keane has been ruled out. Ramiro Funes Mori, Seamus Coleman and Leighton Baines also are sidelined for the Toffees. "Tottenham vs Everton predictions, betting tips, lineups and free bets (Premier League - 13.1.2018)"